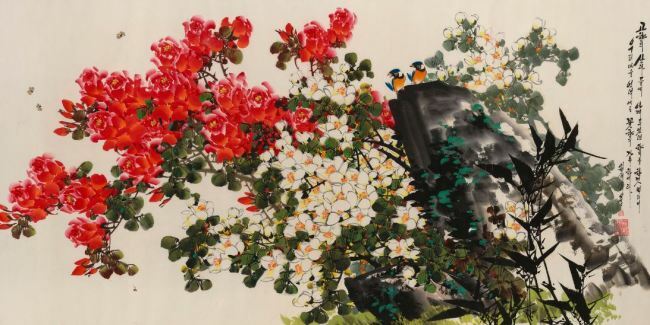 The Song family possesses over 100 paintings from 20 artists in the country, including People’s Artists like Kim Ki-man, Mun Hwa-chun, Rhee Hwa-sik and Oh Young-seong. Since last year, Song has organized three exhibitions in London to show the North Korean works, with the most recent one, “North Korea: Natural Beauty,” wrapping up on Nov. 11. “People who come to exhibitions actually come in thinking that North Korea is a horrible country, and the artwork would be miserable: It would be grey, dark, and scary. “But beside all of that, there’s life in North Korea. People have jobs, they have kids, they go about their daily lives,” Song said, stressing that besides issues that frequently appear in the media, there are still vibrant life, nature and culture that breathes within the country. The London School of Economics-educated Song said she became interested in the country while she was looking into frontier markets. She took note of the legendary investor Jim Rogers, who spoke of the great potential of the North Korean market, and on his encouragement, went to visit the Rason special economic zone. Distancing herself from anything related to politics, Song said she saw potential in the little-known North Korean art world. “In North Korea, art is a real craft. It’s very much about the number of years you developed and practiced. ... The collection is focused on Joseon-hwa (what North Koreans call paintings drawn in traditional Korean style), and that technique takes a long time to develop because it’s drawn on thin paper, and you can’t really make mistakes,” she said. In an age where so many contemporary artworks are abstract art that requires interpretation, she said visitors to the London exhibitions appreciated the beauty of the artworks that speak with their sheer beauty. “In North Korea, artists are for people, and everyone should enjoy it equally,” she said. She has set up a Chosun Artisan website where visitors can view the paintings with information about the artists, along with notifications about past and present exhibitions. Song said she hopes to one day bring the artists to her exhibitions to show them at work. While Song is open to ideas about loaning her paintings to other countries including South Korea, she is careful not to appear to be on North Korea’s side. She expressed hopes that a better understanding of North Korean culture can contribute to the country improving relations with the rest of the world. “I definitely think part of the mission is to show people a different side of North Korea, so they can relate to the country. Right now, nobody can relate to North Korea because they think it’s a monster,” she said. Song said that she feels it is her mission to share North Korea’s art with the world. “So they (the public) would see a different side (of North Korea),” she said.